Malaysia Airlines Flight 17 was an international passenger flight travelling from Amsterdam to Kuala Lumpur that crashed on 17 July 2014. It is presumed to have been shot down by a missile, killing all 283 passengers and 15 crew on board. The Boeing 777-200ER airliner lost contact about 50 km (31 mi) from the Ukraine–Russia border and crashed near Torez in Donetsk Oblast, Ukraine. This territory controlled by pro-Russian separatists. The crash occurred during the Battle in Shakhtarsk Raion, part of the ongoing war in Donbass, in an area controlled by the Donbass People's Militia. According to American and German intelligence sources, the plane was shot down by pro-Russian separatists using a Buk surface-to-air missile fired from the territory which they controlled. The Russian government blamed the Ukrainian government, and said it has radar data indicating the presence of a fighter jet close to MH17. None of these reports and allegations have been formally substantiated with evidence and presented to The Dutch Safety Board (DSB). The DSB is currently leading an investigation into the incident and issued a preliminary report on 9th September 2014. It is expected that a final accident report will be presented in August 2015. This was Malaysia Airlines' worst air disaster and the second in 2014 following the loss of MH370 in March. The DSB reported that the aircraft was in an airworthy condition at departure and there were no known technical malfunctions. The aircraft entered commercial service on 7th June 1995. On Thursday, 17th July 2014, Malaysia Airlines Flight 17 departed from Amsterdam Airport Schiphol Gate G03 at 12:14 CEST and was due to arrive at Kuala Lumpur International Airport at 06:00, Friday 18 July MYT, 17th July UTC. According to the original flight plan, MH17 was to fly over Ukraine at FL330 (33,000 feet or 10,060 metres) and then change to FL350 above Dnipropetrovsk. 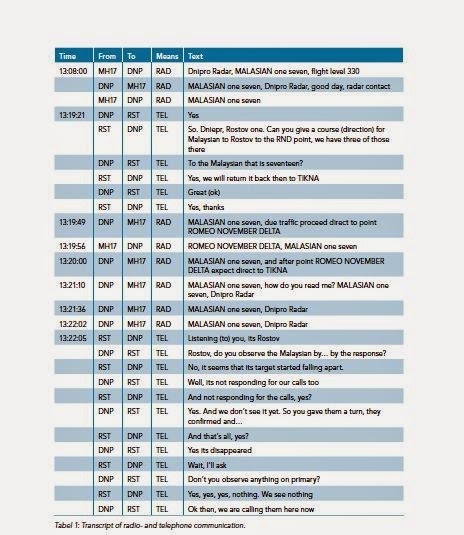 When it reached the area at 12:53 UTC Dnipropetrovsk Air Control (Dnipro Control) asked MH17 if they could climb to FL350 as planned, and also to avoid a potential separation conflict with another flight, Singapore Airlines Flight 351, also at flying at FL330. The crew asked to remain at FL330 and the air control approved this request, moving the other flight to FL350. At 13:00 UTC the crew asked for a diversion of 20 NM to the left (north) due to weather conditions. This request was also approved by Dnipro Control. The crew then asked if they could climb to FL340, which was rejected as this flight level was not available at that time, and MH17 remained at FL330. At 13:19 UTC Dnipro Control noticed that the flight was 3.6 NM north from the centerline of the approved track and instructed MH17 to return to the track. At 13:19 UTC Dnipro Control contacted Russian air control in Rostov-on-Don (RND) over telephone and requested clearance for transferring the flight to Russian air control. After obtaining the permission, Dnipro Control attempted to contact MH17 and pass them the details of Rostov-on-Don track at 13:20 UTC. After MH17 did not respond to several calls, Dnipro Control contacted RND again to check if they could see the Boeing on their radar. RND confirmed that the plane had disappeared. The Dutch Safety Board reported a last flight data recording at 13:20 UTC, located west of Rozsypne, heading 115° at 494 knots. Three other commercial aircraft were in the same area when the MH17 crashed including the Singapore Airlines Boeing 777 and Air India Flight 113, a Boeing 787, the closest being 25 kilometres (16 mi) away. The aircraft crashed outside Hrabove, near Torez in eastern Ukraine's Donetsk Oblast, with debris spread over a 34 square kilometres (13 sq mi) area to the west and northwest of Hrabove. The fireball on impact is believed to have been captured on video. Photographs from the site of the crash show scattered pieces of broken fuselage and engine parts, bodies, and passports. Some of the wreckage fell close to houses. Dozens of bodies fell into crop fields, and some fell into houses. Some villagers reported to a BBC TV crew that they saw a military jet in the area at the time MH17 fell from the sky. Recorded video of these witness accounts was initially broadcast by the BBC, but the report and footage was subsequently removed when the BBC reported editorial issues with the piece. On the day of the crash, a meeting was convened of the Trilateral Contact Group (consisting of the Organization for Security and Co-operation in Europe (OSCE), the Ukrainian national government, and Russia). After they had held a video conference with representatives of insurgents affiliated with the Donetsk People's Republic (who control the area where the aircraft crashed), the rebels promised to "provide safe access and security guarantees" to "the national investigation commission" by co-operating with Ukrainian authorities and OSCE monitors. During the first two days of investigation, the militants prevented the OSCE and the workers of Ukrainian Emergencies Ministry from freely working at the crash site. Andre Purgin, a leader of the Donetsk People's Republic, declared later that "we will guarantee the safety of international experts on the scene as soon as Kiev concludes a ceasefire agreement". On 18th July, it was reported that the flight recorders had been recovered by separatists. On the same day, the head of Donetsk Regional State Administration, Kostiantyn Batozky, stated that both flight recorders had been found. On 21st July, Malaysian Prime Minister Najib Razak said that he had been told by Alexander Borodai, leader of the Donetsk People's Republic, that the black boxes would be handed over to Malaysian authorities. Later that day, the flight data recorder and the cockpit voice recorder were handed over to Malaysian officials in Donetsk by rebels. The black boxes were examined at a facility operated by the UK AAIB. On 23rd July it was reported that the CVR was damaged but there was no evidence that it had been tampered with; it was also reported that authentic data had been downloaded. Since 23rd July an international investigation team has been conducting an off-site examination to determine why the aircraft crashed. In agreement with the Ukrainian government, the Netherlands are leading this investigation. The investigation team consists of 24 investigators with members from Ukraine, Malaysia, Australia, Germany, the United States, the United Kingdom and Russia. In addition to the international accident investigation, the selection of the flight route will also be independently investigated by the Dutch Safety Board. The National Bureau of Air Accidents Investigation of Ukraine (NBAAI) had requested that the DSB participate in the international investigation; the DSB received formal notice of the accident from the NBAAI on 18th July. The NBAAI, which lead an international off- and on-site investigation during the first days after the crash, delegated the investigation to the DSB because of the large number of Dutch passengers and the fact that the flight originated in Amsterdam. A Malaysian team of 133 officials and experts, comprising search and recovery personnel, forensics experts, technical and medical experts arrived in Ukraine. Australia sent a 45-member panel headed by former Air Chief Marshal Angus Houston, who had earlier supervised the MH 370 probe. The United Kingdom sent six investigators from the Air Accidents Investigation Branch (AAIB) and the UK Foreign Office has sent extra consular staff to Ukraine. It took until late July that the full international team could start working at the crash site, under the leadership of the Dutch Ministry of Defence. On 6th August, the experts left the crash site due to concerns about their safety. In mid-September they attempted to regain access to the site but did not have any success. On 13th October a Dutch-Ukrainian team resumed the recovery work to gather personal belongings of the victims. In mid-November, work was undertaken to remove part of the wreckage from the crash site. Earlier efforts by the recovery team to salvage the MH17 wreckage had been stalled over disagreements with the local rebels. The recovery operation took one week to complete. The debris would be transported to the Netherlands where investigators will reconstruct parts of the plane. The Dutch-led forensic team has so far identified the bodies of 292 out of 298 victims of the crash. On 9 September 2014, the preliminary accident report was released by the Security Council of the Netherlands (Dutch Safety Board). The preliminary report concluded that the aircraft and crew prior to the ending of the CVR and FDR recording at 13.20:03 hrs (UTC) were not implicating any technical or operational failure, due to the absence of any corresponding evidence. Furthermore, the report said that "damage observed on the forward fuselage and cockpit section of the aircraft appears to indicate that there were impacts from a large number of high-energy objects from outside the aircraft". According to the investigators, this damage likely led to a loss of structural integrity that caused an in-flight breakup first of the forward parts of the aircraft and then the remainder with expansive geographic spread of the aircraft's pieces. The criminal investigation into the downing of MH17 is being led by the Public Prosecution Service of the Dutch Ministry of Justice. The investigation is the largest in Dutch history, involving dozens of prosecutors and 200 investigators with different specialties. Detectives are looking at forensic samples from bodies and luggage, interviews with witnesses, satellite data, intercepted communications, and information on the Web. Of particular interest to investigators are 25 pieces of iron; investigators are trying to establish whether or not they came from a surface to air missile. In December 2014, a significant amount of the wreckage from MH17 was transported by truck from the Ukraine and investigators began the tagging and re-assembly of parts of the aircraft. The team of international aviation investigators who investigate the cause and contributing factors of the crash of flight MH17 concluded the investigation meeting at Gilze-Rijen. In the past week they conducted several investigations on the wreckage, including the fractures, the failure mechanisms and the impact patterns. This meeting is part of the procedures prescribed by the ICAO provisions on international aircraft accident and incident investigation. 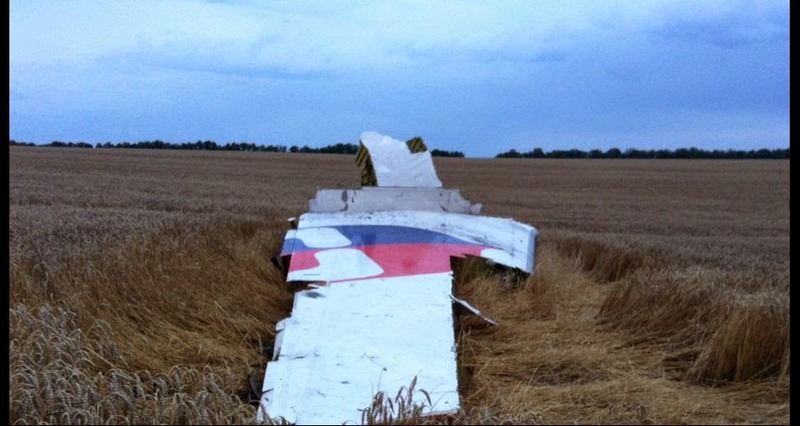 The investigators represented the countries involved in the MH17 investigation: Ukraine, Malaysia, Australia, United States, United Kingdom and the Russian Federation. The representatives of Belgium and Germany attended the meeting on February 17. A representative of ICAO was also present. Next week preparations will be made for the visit of next of kin to see the recovered wreckage in the first week of March. The planned three-dimensional reconstruction of a part of the aircraft will start soon. The next of kin will be allowed to view this three-dimensional reconstruction at a later time. 533 relatives of 151 victims of flight MH17 visited the wreckage of the aeroplane. Among them were relatives of victims from other countries. Groups of next of kin were taken around the three locations where the wreckage is located; the hangar where the investigation is taking place and the two shelters where the remaining pieces of wreckage are stored. These visits went well. In the shelters, relatives could touch a number of pieces of wreckage. In the hangar where the actual investigation is taking place, they could view the wreckage from a raised platform. In addition, there was a site set up where flowers could be left. “The great majority of the next of kin were pleased to have been offered the opportunity to visit the wreckage. To actually see the pieces of wreckage is important“, said Safety Board Chairman Tjibbe Joustra. In the past months the pieces of wreckage have been carefully checked, sorted and investigated. In February, the team of international investigators performed, among other matters, fracture investigation, investigated the failure mechanism and investigated the impact patterns. Now that the visits by the next of kin have taken place, work on the three-dimensional reconstruction will begin. The reconstruction will focus on the exterior of the cockpit and a part of the business class section. Once the reconstruction is complete the next of kin will receive an invitation to see this. At the Air Force base in Gilze-Rijen both the Dutch Safety Board and the Public Prosecutor are investigating the wreckage. In addition to the investigation into the cause of the accident, the Safety Board is also investigating the release of passenger name lists and the decision processes regarding flight routes. The Public Prosecutor‘s criminal investigation aims to bring those responsible for the accident before a judge. In the investigation of the flight MH17, the Dutch Safety Board said it wants to be able to confirm its final conclusion against multiple sources. The DSB was reacting to a recent news report on Dutch TV news channel RTL. This is a complex and time-consuming process. As a part of this, the link to the Malaysian Airlines aeroplane has to be demonstrated for each source, in part because the aeroplane crashed in an area of civil conflict. The Dutch Safety board released its final report on the downing of Malaysia Airlines Flight MH17 on October 13th, 2015. The DSB held a presentation for the media about its findings at the Gilze-Rijen military base in the Netherlands.